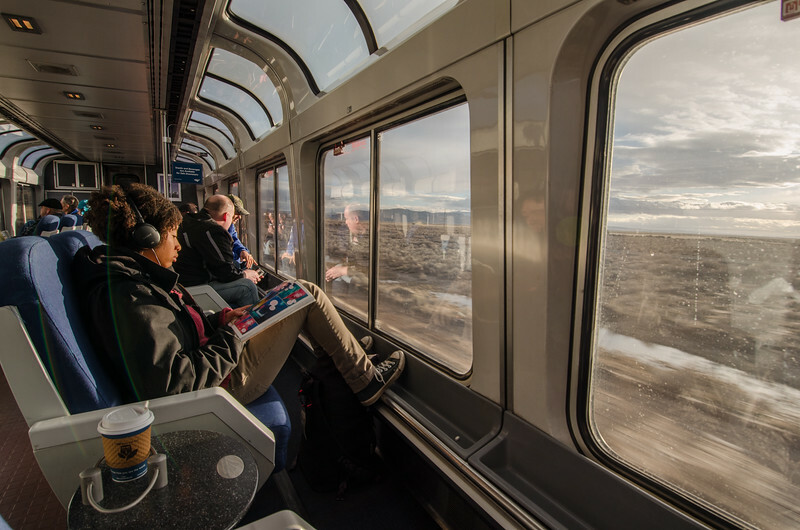 The Amtrak Coast Starlight train runs 1,200 miles up the West Coast of the U.S. from Los Angeles to Seattle. We took the train north along this route back in January 2011. We were headed to Southern Oregon for a nature photography conference and to begin Oregon coast road trip with Kevin’s dad. 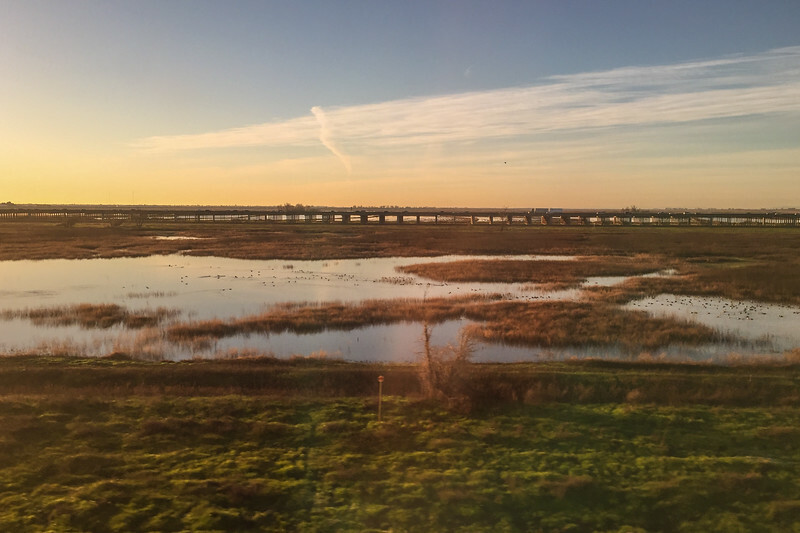 It had been a clear and relatively warm, sunny day in the Bay Area when we boarded the train. The next morning, I woke up and looked out the window to see a winter wonderland somewhere in the remote area of the Cascade Mountains. The train wove it’s way through untouched new fallen snow and vistas that they talk about in Christmas carols. I couldn’t believe I was still in California. 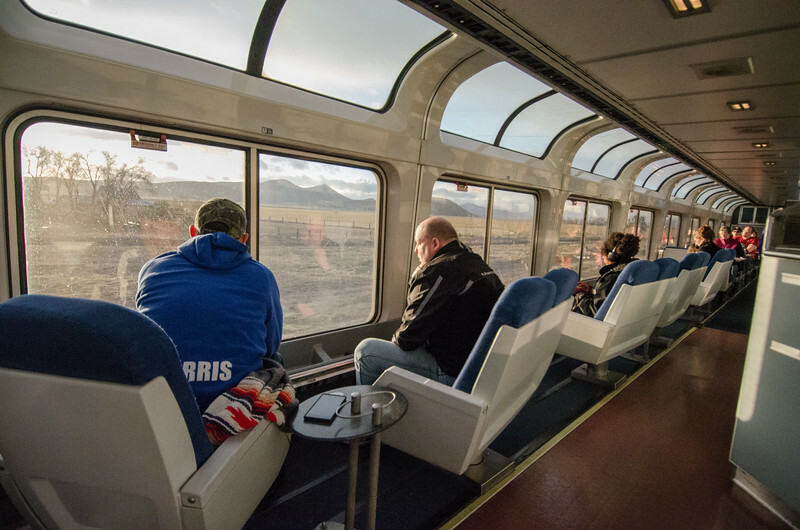 On our recent birdwatching trip to Southern Oregon, we decided to take Amtrak again to relive this experience. It’s an eleven and a half hour trip from San Jose, CA to Klamath Falls, OR. Because the train traveled overnight, I booked a “roomette,” Amtrak’s name for their basic two person sleeper cabin. 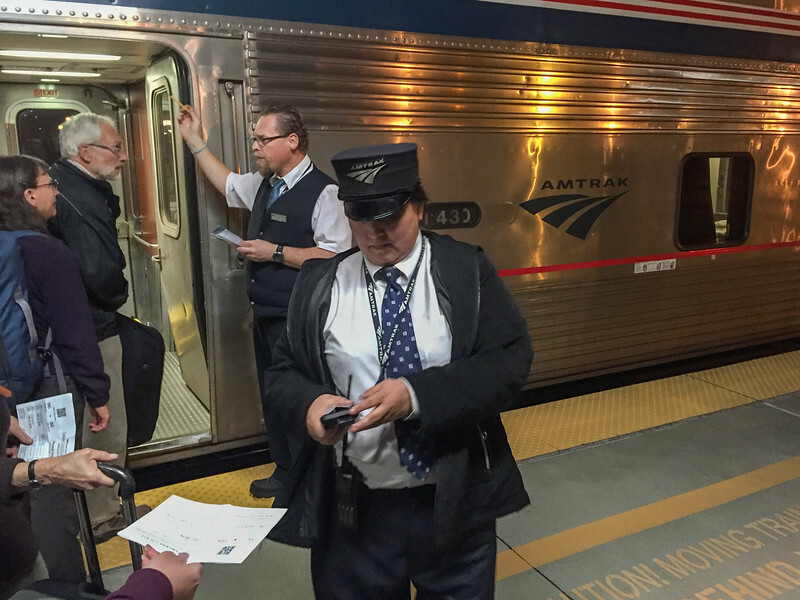 Have you ever wondered what it’s like to travel overnight on an Amtrak train? 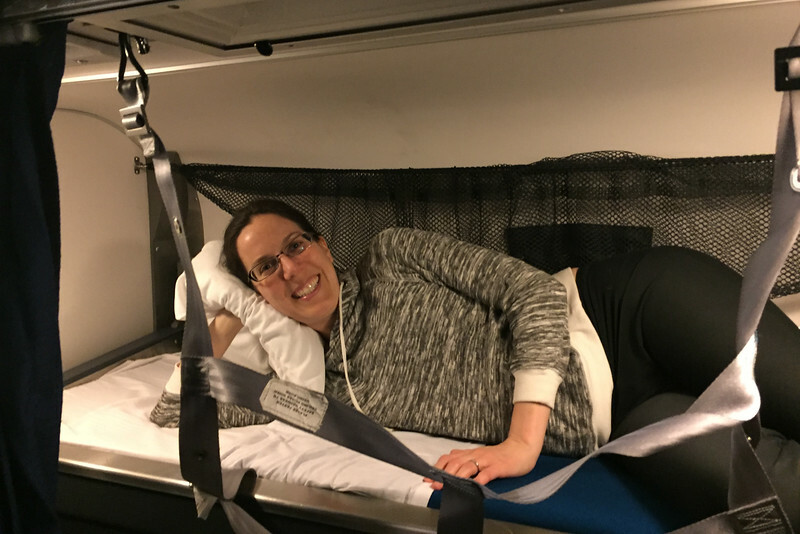 Here’s a tour of the sleeper car experience, in photos. 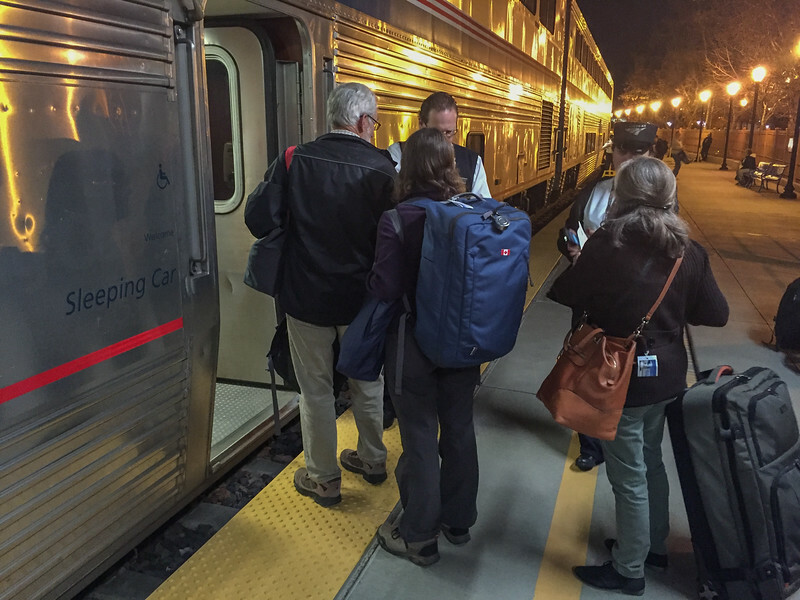 Our train arrived on the platform at about 8:15 pm at Diridon Station, San Jose’s main train station and transit center. The first few cars were sleeper cabins and we were allowed to board first. Every car has an attendant who will show you to your cabin, take down your beds at night, and fold up your beds in the morning. Our attendant was kind enough to stop for a picture. 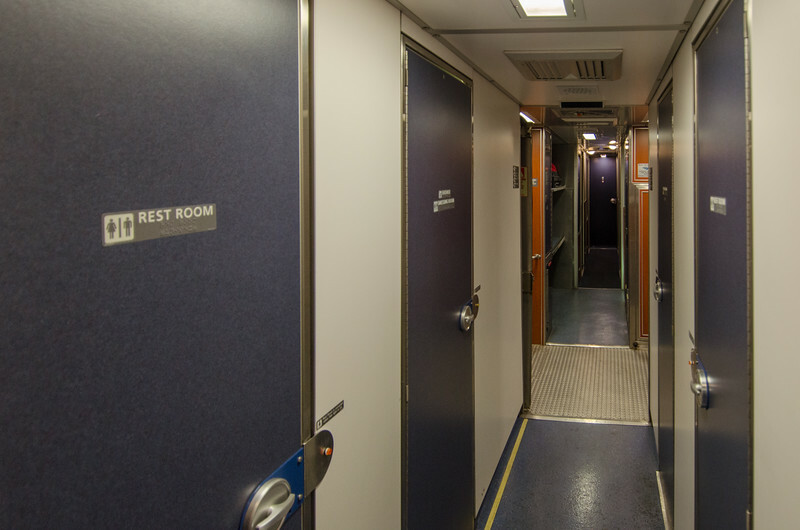 All long-distance Amtrak trains have sleeper cars that offer a variety of room choices. 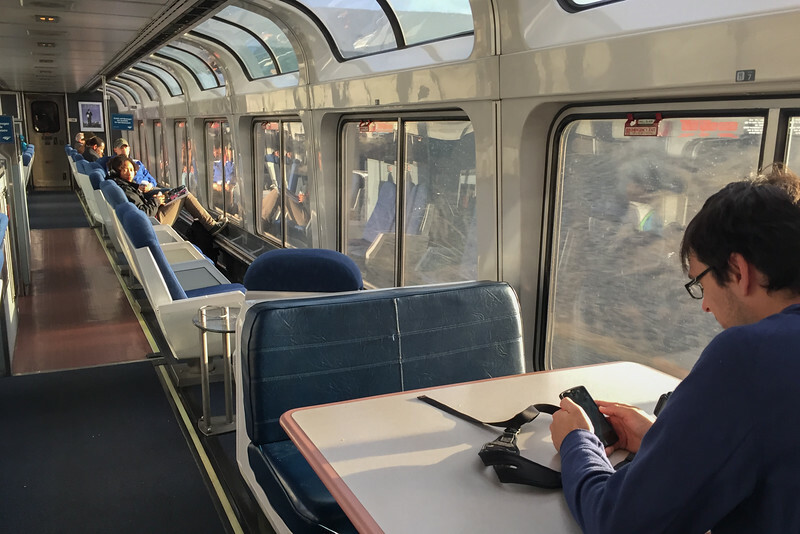 The basic option is the on or two-person “roomette,” a small cabin with two seats facing each other, a small window with curtains you can close, and a curtain-covered sliding glass door (difficult to see) that you can close for privacy. 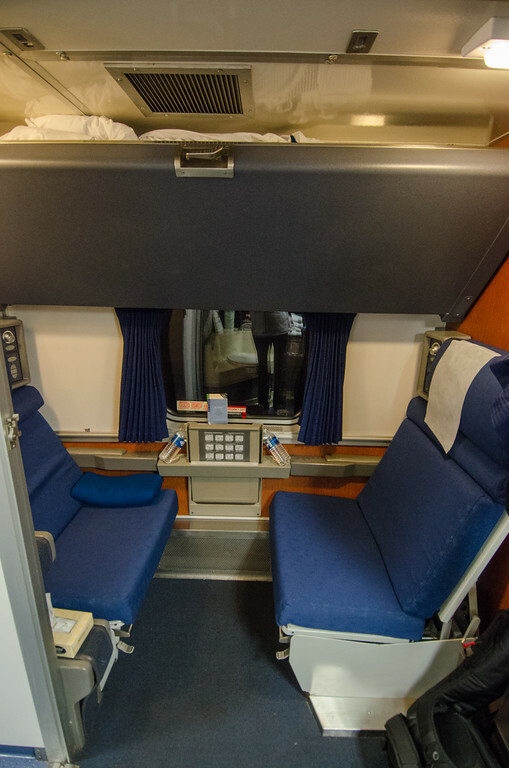 The roomette includes the world’s narrowest closet (for hanging up a few pieces of clothing), a carpeted shelf (it fit one carry-on-size suitcase and two camera bags), an outlet, light controls, and temperature controls. If you need room for more luggage, you can store them in a shared luggage rack on the first level. Because we boarded just before the last seating for dinner (8:30pm), we dropped our bags in the cabin and ran to get food. When we returned from dinner we saw our attendant had unfolded our beds. 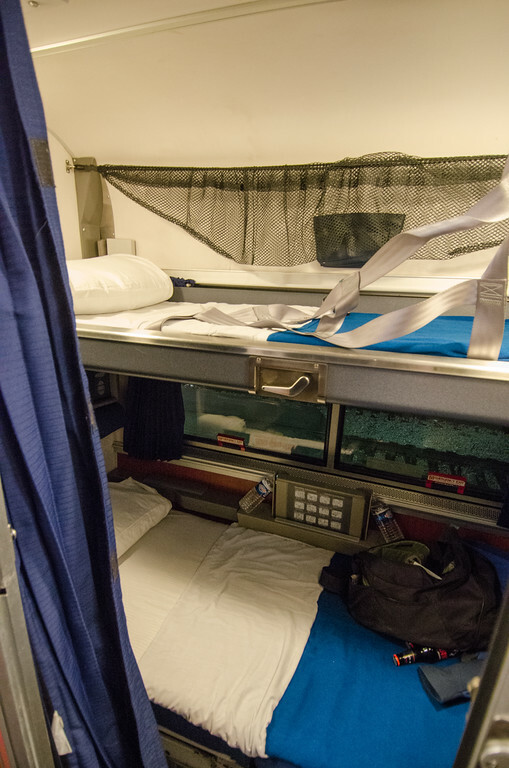 The lower two seats fold out into one twin-sized bed, and a top bunk folds down from the ceiling. The top bunk was narrow, but not uncomfortable. There was a seatbelt “web” that you could hang up to provide a barrier to keep you from falling out of bed. I couldn’t seem to unfurl it properly. There was a top bunk reading light and a hanging mesh bag where you can stash books, water bottle, and eyeglasses. There are several shared restrooms down the hall and one shower room on the first floor. 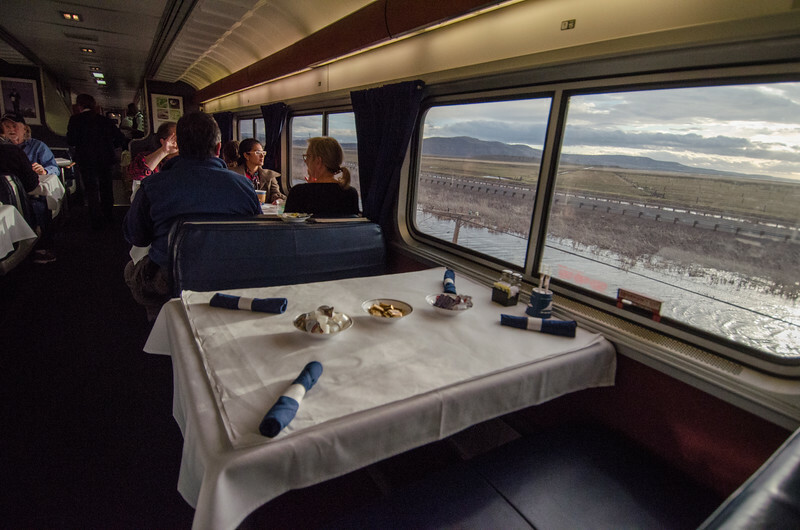 If you book a room in the sleeper car (“first class”), up to three full-service meals a day are included in your ticket. 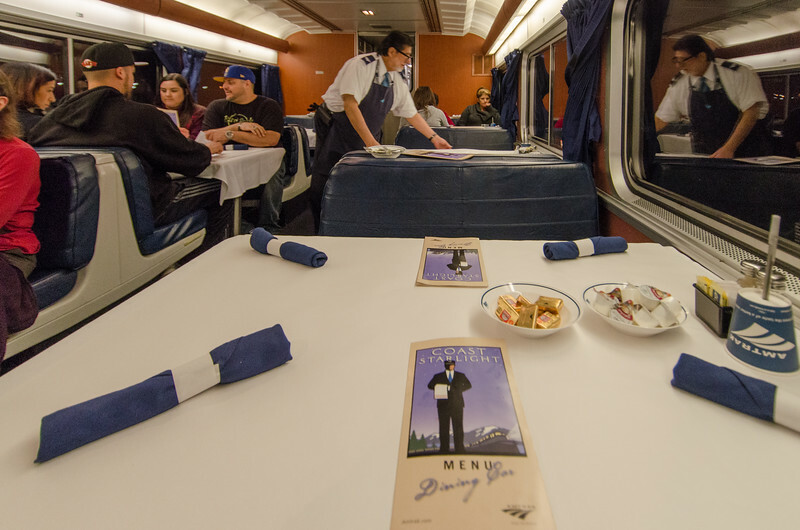 If you are seated in coach, dining car meals are available for purchase. Because our train departed San Jose at 8:23pm and arrived in Klamath Falls at 8:07am, we were eligible for both dinner and breakfast (I believe dinner ends at 9pm and breakfast starts at 7am). Bring cash for tipping your server. Meals and one beverage (water, soda or juice) are included. Beer or wine is available at an additional cost. Here a link to the current (2016) menu. 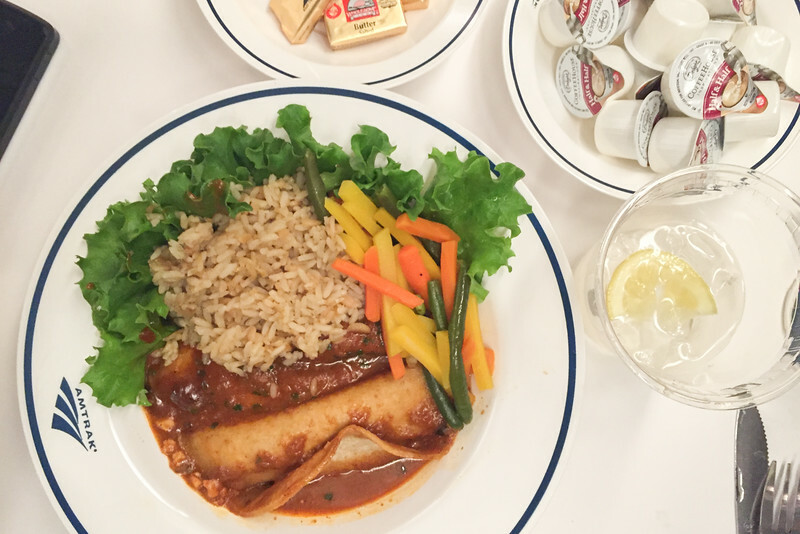 I ordered the vegetable enchiladas–they were not too soggy nor dry, and the vegetables were fresh and flavorful. It was a lot better than airplane food! 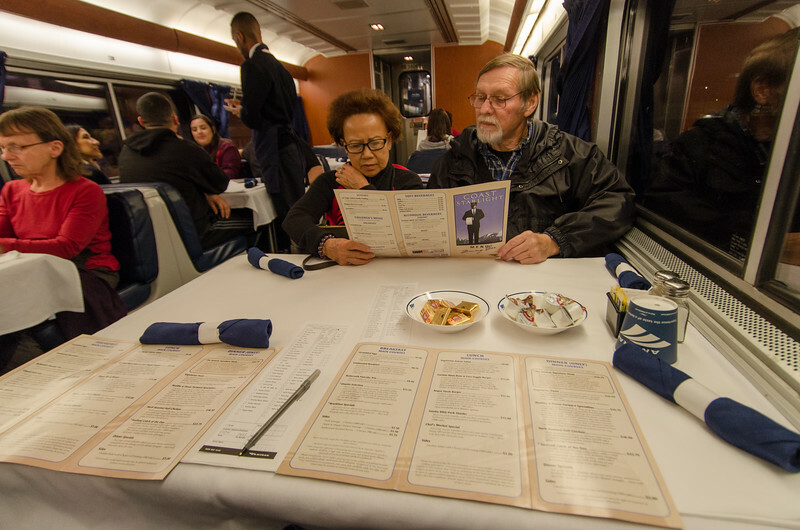 The dining car offers community seating–they place you with other passengers to make tables of four. If you are traveling as a group of four, you can reserve a table in advance to be sure you are seated together. 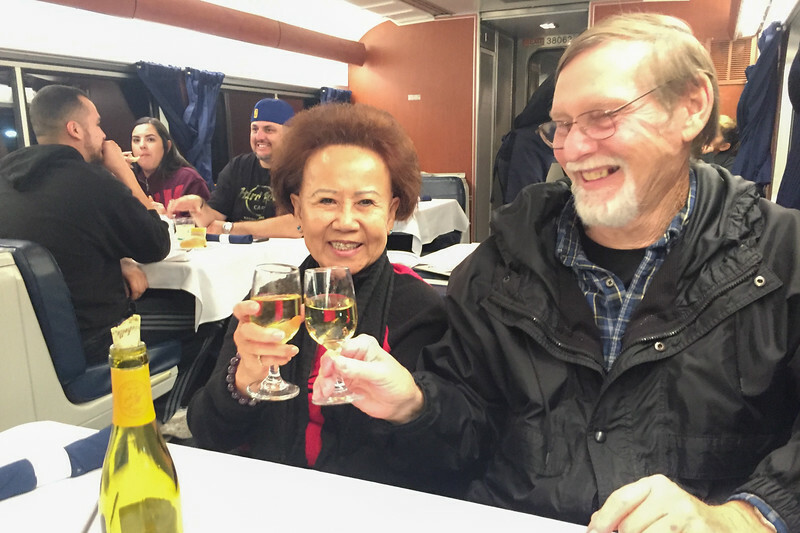 We were seated with Elaine and Lyle, two retirees from Milpitas, California that had boarded with us in San Jose. They were headed to Eugene, Oregon to visit their daughter. They said they prefer to travel by train because it’s more relaxing than the long drive. The bought a bottle of wine to celebrate the start of the trip. After dinner and dessert (ice cream cups we opted to take back to our room), I stopped into one of the lounge cars. These are cars with floor to ceiling windows and assorted seat options. During the day, guests could sit to enjoy the view, and at night they can spread out at tables to have some workspace at night. Every car has wifi access but there’s not a good place to use a laptop in the small roomettes. After dinner, we settled into bed early to read and go to sleep. I’m a restless sleeper but I slept pretty well. I fell asleep quickly, and though it took some time to fall back to sleep after waking in the middle of the night. The bed was comfortable, but I couldn’t get used to the rocking movement of the train and the sounds of the train on the tracks. I finally pulled out the sound-blocking silicone ear plugs that I always pack, and that helped a lot. We woke up by about 6:30am and headed right to breakfast. 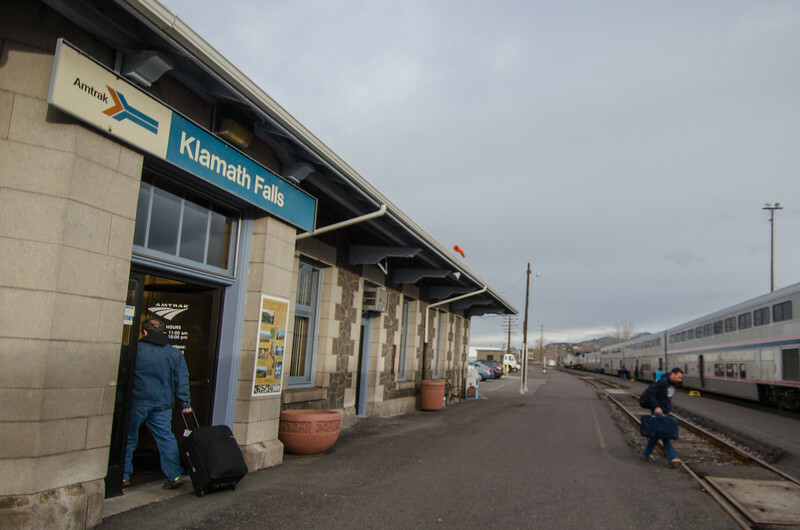 I wanted to have time to eat and explore the train before arriving in Klamath Falls at 8am. … or enjoy the view. The morning flew by and before I knew it, it was 8am and we had arrived in Klamath Falls, Oregon. We tipped our attendant and bid farewell. 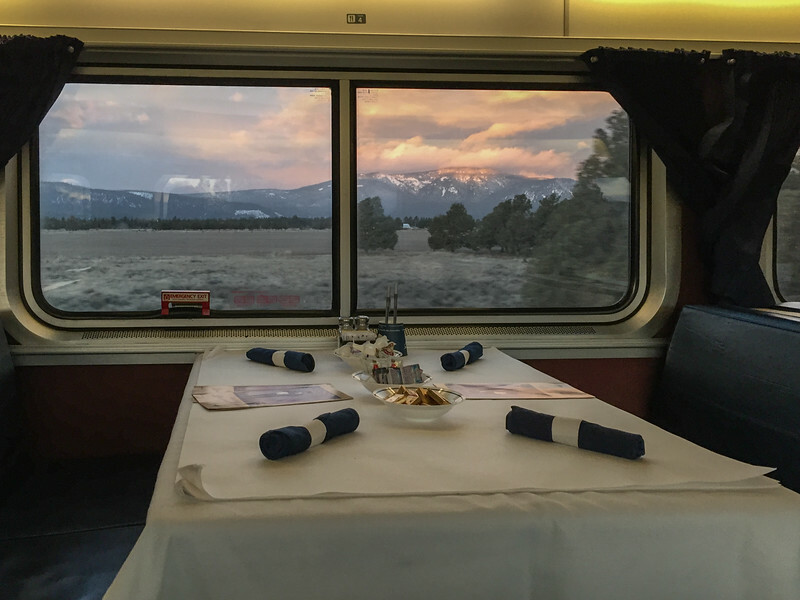 When you board, ask your sleeping car attendant to make reservations for the dining car to be sure you get a seat at your preferred time. Lunch hours are generally from 11:30 am – 3 pm and dinner hours are generally from 5 pm – 9 pm. 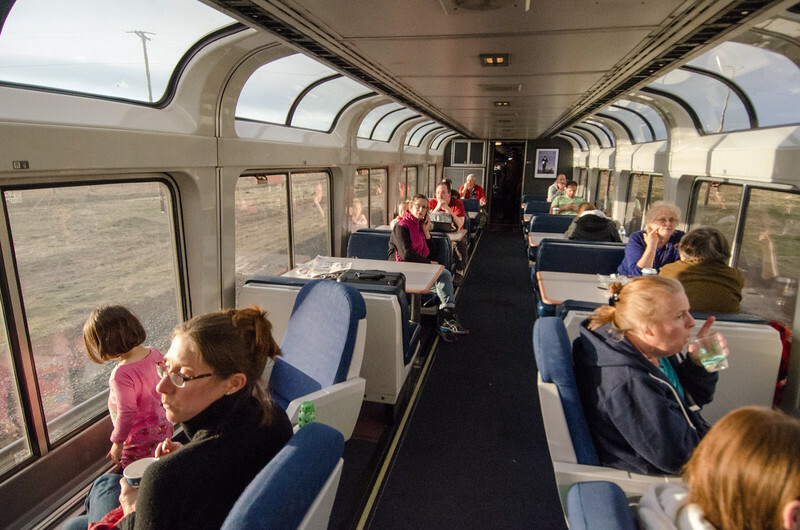 Brings nonperishable snacks and beer/wine, if you are in a sleeper car–alcohol is not allowed in coach. There are no microwaves or refrigerator available for passengers. Bring cash for tips–if you are in a sleeper car, your meals will be covered as part of your fare but you will need to tip your server. You also need to tip your sleeping car attendant before you leave. If you get cold easily, bring layers to wear and/or a light throw blanket. 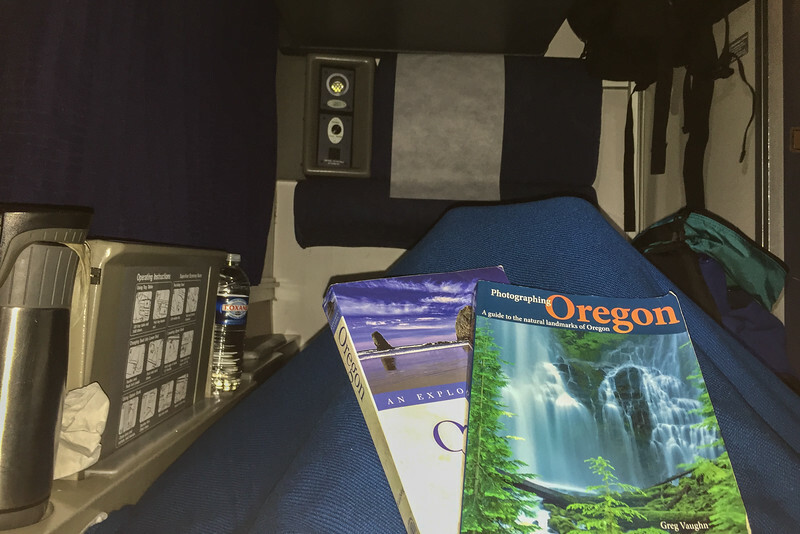 The sleeper car bedding is relatively thin so you may want an extra layer to stay warm on cold nights. If you are a light sleeper, bring ear plugs to help block out the sounds of the moving train. 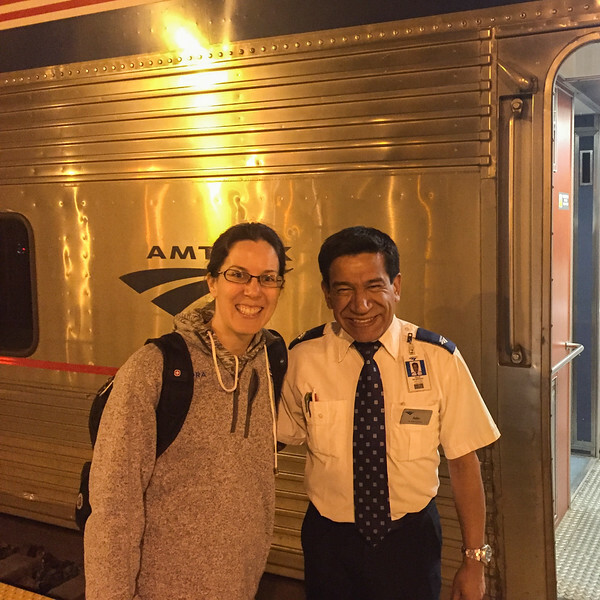 Our trip was discounted by Amtrak for the purpose of this review. All photos are my own. 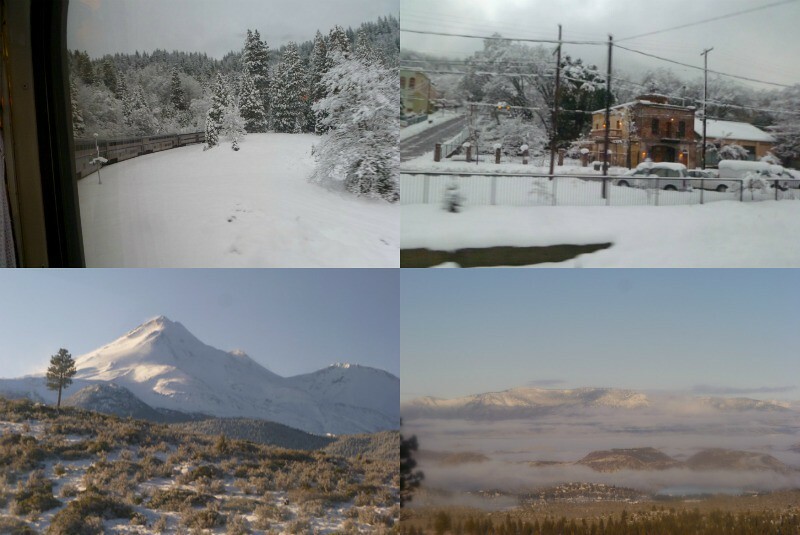 It was, my favorite part were the views of the San Francisco Bay, the green hills and agricultural fields near Sacramento, and of course, the snowy Sierra Nevada mountains. The trip wasn’t quite long enough to give me a lot of free window gazing time, but it was a fun experience. I’d love to go cross country one day! Aww… Cassie, one day I sit in AMTRAK too. I like the Lounge Car and I like the fact, that Amtrak is slower than German trains. I like to travel, not to flee! ? I’m cycling up and down the hills with my mountain bike around my home Rechtenstein http://rechtenstein.de/?page_id=18 in order to stay young and fresh for my California trips …one day… ? Hi. Great report. 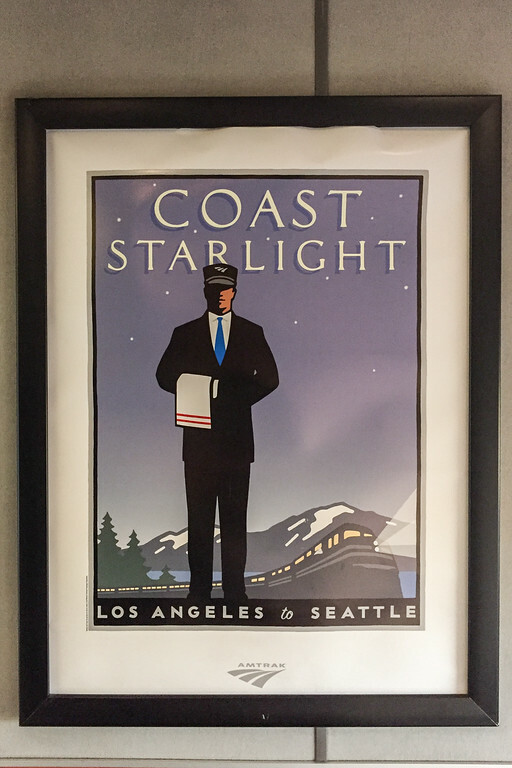 I am in consideration to take the Coast Starlight from Seattle to Los Angeles. If our first picture of the sleeper car, the window looks VERY small. But it looks much bigger in the second picture when the two seats are now a bed. Are there different kinds of roomettes? Good catch, Gene–I hadn’t noticed this! These photos were actually two different roomettes. When we first boarded the train, our room wasn’t ready yet, so they had us place our luggage in the lower-level, handicap-accessible roomette… that’s the one with the small-looking window (there may be two windows beside it, those white areas may be shades?) but I’m not sure. I BELIEVE that most of the roomettes were on the second level, which was the room pictured when the beds were unfolded. When we rented a roomette in 2011, it was also on the second level and had the room-length windows like the second photo. Thanks for the intel, especially the meal service hours! We are taking the CS in a couple weeks, out first train overnight. Great and helpful information! Did you spend any time in the Parlor car? 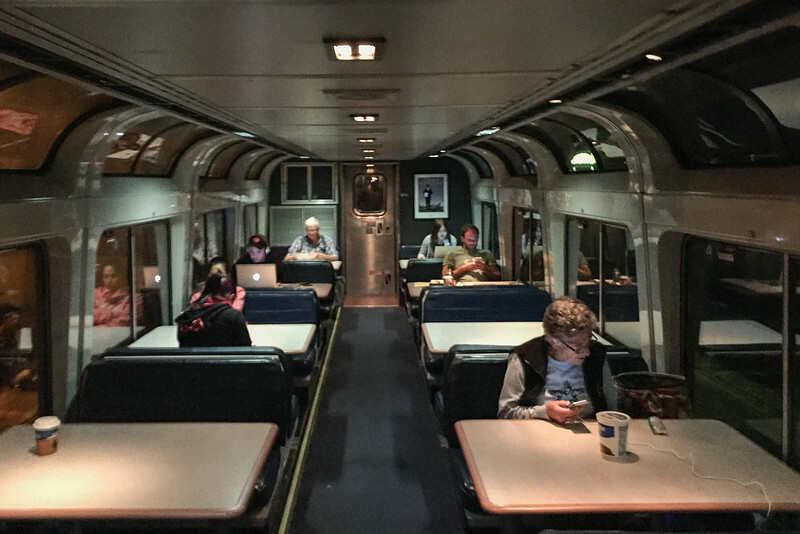 Is the Parlor car the same as the dining car? 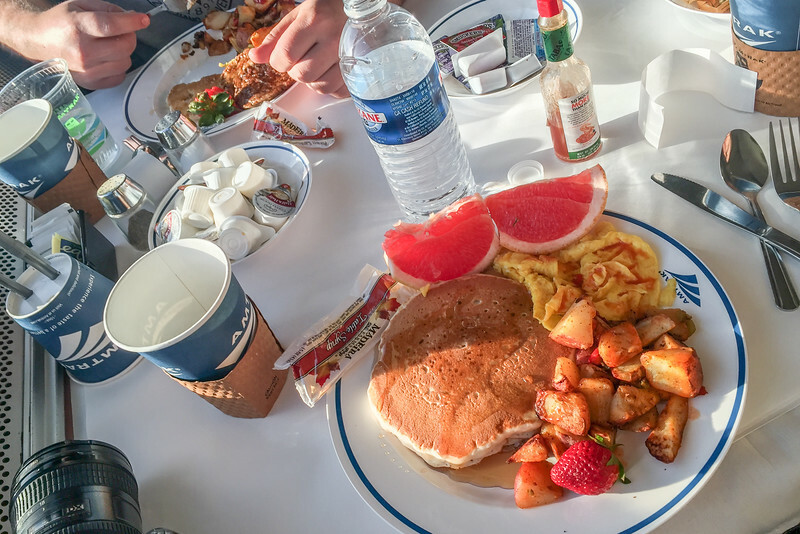 I don’t think there was a second car with food/coffee service (like I’ve seen on the Capital Corridor train–that one has a cafe car), but I could be wrong. We weren’t on it long enough to find out! I want to plan a longer trip, heading all the way up the coast the next time! What route did you do? What was your experience like? Hope you had a great trip!